Apartments in Kakkanad, Kochi , by Galaxy Homes (P) Ltd.
Galaxy Cloud Space, A seamless amalgamation of luxury, comfort and style blend to provide a truly sophisticated lifestyle. These Residential Apartments in Kochi are beautifully planned keeping in mind the architecture which can soothe your senses whenever you step into your house after a tiring day from work. Galaxy Cloud Space by Galaxy Homes Private Limited in Kakkanad strives for customer satisfaction and believes in building world-class projects without compromising on quality standards, innovation and timely delivery. With well-ventilated apartments and uncluttered nature space, Galaxy Cloud Space makes you feel that every day is an excursion. Galaxy Cloud Space is one of the best investments in Residential properties in Kakkanad, Kochi. The Apartments in Galaxy Cloud Space are strategically constructed keeping in mind excellent connectivity of public transport. 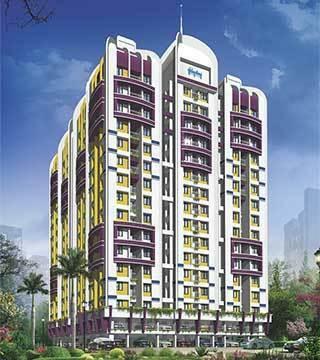 Galaxy Cloud Space presents 3 BHK Apartments in Kochi. The price of Apartments at Kakkanad in Galaxy Cloud Space is well suited for the ones looking to invest in property at Kochi. Amenities: Galaxy Cloud Space has been designed such that it includes all the world-class amenities such as 24Hr Backup Electricity, Club House, Gated community, Gymnasium, Health Facilities, Intercom, Landscaped Garden, Lift, Play Area, Rain Water Harvesting, Security, Swimming Pool and Tennis Court. Location Advantage: Galaxy Cloud Space is conveniently located at Kakkanad to provide unmatched connectivity from all the important landmarks and places of everyday utility such as hospitals,schools,supermarts, parks,recreational centers etc. Location of this project offers decent life style and has access to Workplaces, Schools. But does not have access to Parks, Cafes. etc. It has access to Star Hotels like Royal Residency and Schools like Mar Thoma Public School and Malls like LULU mall and Workplaces like Info Park and Super Markets like Cee Yem Margin Free Super Market This location is recommended for people who have 24x7 help for daily needs. arthquake resistant R.C.C. foundation on very hard Laterite. arthquake resistant R.C.C. framed structure. Walls made of superior quality hollow blocks. ll doors are made of good quality hardwood frames with moulded skin door shutters, with Godrej / Doorset or equivalent Locks. Vitrified tile flooring of size 60 x 60 cm with 3 mm space filled with Black pointing powder for the entire inside area. eramic tile flooring and walls up to a height of 180 cms. Concealed plumbing, sanitary fixtures and Jaguar / Marc or equivalent C.P fittings. Hot and Cold water mixer with shower and plumbing provision for Geyser in Master Bedroom. Granite counter top, Stainless steel sink with drain board. Provision for storage cabin. Glazed tiles above the working platform up to height of 60 cms. mulsion paint with putty finish for inside walls and ceiling. External Emulsion for external walls and enamel paint for wood work and grills. Three phase KSEB connection with independent energy meter. Concealed Copper wiring of Finolex / V-Guard or equivalent with modular switches of Crabtree or equivalent controlled by ELCB and MCB. Review of Galaxy Cloud Space, Kakkanad? Its price, location, builder etc. Review of Galaxy Cloud Space, Kakkanad location? neighbourhood, connectivity, schools etc.? Comparison of Galaxy Cloud Space, Kakkanad to nearby projects? Is it rightly priced? What is your feedback on this Galaxy Cloud Space, Kakkanad? Depends on brand name and complete the project in time etc? Will this be a better option for investment or to live in Galaxy Cloud Space, Kakkanad? Can you give some suggestion? Is the Galaxy Cloud Space, Kakkanad has more potential in terms of capital appreciation, ROI, Rentals, Proximity to social infrastructure etc?